The virus which causes FIP is "feline coronavirus" (FCoV). Feline coronavirus is very common among cats living in multi-cat households, including catteries, rescues and shelters (basically, anywhere that multiple cats are housed together). "In households containing only one or two cats, the FIP mortality rate is around one in 5,000." - Feline Infectius Peritonitis, PetsWebMD. Cats infected with feline coronavirus, initially do not show any symptoms and antiviral antibodies develop during this time. In a small percentage of cats, a mutation of the virus occurs and infection progresses into clinical FIP which is then referred to as "feline infectious peritonitis virus" (FIPV). White blood cells which are supposed to protect the cat carry the virus throughout the cat's body. Once a cat develops clinical FIP involving one or many systems of the cat's body (abdomen, kidney, brain), the disease is progressive and is always fatal. A five-month-old Persian kitten with FIP. See how huge the belly is? That is due to an accumulation of fluid. There are two forms of FIP: the wet (effusive) form and the dry (non-effusive) form. The wet form is characterized by an accumulation of fluid in the chest or abdomen. The dry form of FIP is characterized by inflammatory sores that can be found in almost any organ of the body, including the nervous system. In both the wet and dry forms of the illness, the cat will experience loss of appetite, weight loss, lethargy, and a fluctuating fever that is not responsive to antibiotics. Most often FIP occurs in cats between 3 and 16 months of age. ..."to produce FIP, it takes not only the mutant virus, but a cat predisposed to mount an ineffective and inappropriate immune response to the virus – the "right" virus and the "right" cat. This is why FIP is uncommon, though infection with FCoV is widespread among cats." (Winn Feline Foundation, Feline Infectious Peritonitis, 2015. "...only a small proportion of cats exposed to these mutant viruses will develop FIP. Resistance to FIP is complicated and involves genetic susceptibility, age at the time of exposure and a number of stressors that occur at the same time as infection and have a negative impact on the ability of the infected cat to eliminate the virus." - The Veterinary Journal, 2014, An Update on Feline Infectious Peritonitis, by Niels C. Pedersen. The ONLY way to positively diagnose FIP is a necropsy (an autopsy on a deceased animal) and even a necropsy does not always result in a diagnosis (the results may be inconclusive). Infectious refers to the disease being communicable by infection from one part of the body to another. Contagious means capable of being transmitted by contact with an infected animal or object. FIP is the medical term for the clinical disease associated with the mutated form of feline coronavirus. FIP is infectious but not contagious. FECV ("feline enteric infection") is the common benign form of the feline coronavirus. (The term "enteric" refers to an infection of the intestines). FIPV ("feline infectious peritonitis virus") is the term used when FECV has mutated into the disease-causing form. FCoV ("feline coronavirus") in general, is called "coronavirus". No. According to research, FIP is not passed from cat to cat. While all cats (as well as other animals and humans) may have feline coronavirus in their system that does not mean it mutates into clinical FIP. It is estimated by veterinary research professionals like, Dr. Janet Foley and Dr. Niels Pedersen of the University of California at Davis Veterinary School, that more than 90% of cats with FECV remain healthy. However, in a very small number of cases, the benign form of the coronavirus mutates which is the first step in a chain of events leading to FIP. Most veterinarian health research experts believe FIP is not contagious. These leading researchers believe cats that are ill with FIP are not a risk to other cats and thus do not need to be isolated from other cats. However, personally, I would always err on the side of caution and isolate (quarantine) a new cat and always practice good animal husbandry (see recommendations below). FIP is a REACTION to infection with the mutated feline enteric coronavirus (FECV). Most cats who become infected with FECV essentially get a flu and never develop anything more serious. In a very small amount of felines with FECV the virus will mutate into FIP. When a Cat Dies From FIP, What is the Infection Risk to the Other Feline Housemates? The other feline housemates likely already have the coronavirus. However, as stated above, it is HIGHLY UNLIKELY the housemate cats will develop clinical FIP. Even in instances when FIPV carriers are known to be present in a household, the chances of other cats developing clinical FIP are very rare and at best, sporadic. However, as a pet lover and cat owner, I recognize the term "highly unlikely" does not help nor make one feel better when it is your cat or kitten that becomes sick with this deadly disease. "In most multicat households with unusually high cat numbers, FCoV is endemic and FIP is almost inevitable. Households of <5 cats may spontaneously and naturally become FCoV-free, but in households of >10 cats per group, this is almost impossible because the virus passes from one cat to another, maintaining the infection. In these FCoV-endemic environments, such as breeding catteries, shelters, foster homes, and other multicat homes, there is virtually nothing to prevent FIP." Merck Manual Veterinary Medicine. Can I Protect my Cat from FIP? Keep the cats as healthy as possible and minimizing exposure to other infectious diseases (example: Feline Leukemia) decreases the likelihood of cats developing FIP. Keep litter boxes clean and located away from food and water dishes. Feces should be scooped and disposed of on a daily basis, and the litter box should be thoroughly cleaned and disinfected regularly (once a month). Prevent overcrowding, keeping cats current on vaccinations, and proper nutrition may also help to reduce the occurrence of FIP. Additionally, there is clinical evidence suggesting the incidences of FIP are higher in places where over-crowding exists, lack of cleanliness is present (i.e., dirty and unscooped litter boxes and lack of cleaning/disinfecting), and obviously places where cats of unknown origin are housed too close together (shelters and rescues). And, yes, at some cat breeders (catteries) because of the afore-mentioned reasons. Why Your Breeder Does Not Want Your Cat Vaccinated For FIP? The American Association of Feline Practitioners Feline Vaccine Advisory Panel does NOT recommend the FIP vaccine. Also, vaccinating the cat with the FIP vaccine will then result in "positive" antibody titers for feline coronavirus - a "false positive" test result. I am a life-long cat owner (over 50 years) and have been breeding and showing Persian cats for almost 20 years now. This amounts to (an estimate only) about 50 adult cats and 300 kittens coming into and out of my home over the combined 50 years of owning cats. How many times have I personally had, or any of my kitten buyers had, an instance of clinical FIP? In almost 20 years of breeding, raising, and showing Persian cats, I have had one suspected case (but a necropsy was inconslusive) in a year old cat I owned. Last summer (2018), one of my older kittens that I was going to keep also developed FIP and was euthanized. Last year was an incredibly stressful time in both my life and my cats' lives. Additionally, during my time as a breeder, I have been notified by eight different kitten buyers of suspected FIP cases. In the cases, where necropsies were done, they were inconclusive. But, it is my belief these instances were FIP. While FIP is CERTAINLY not my fault nor the fault of my kitten buyers, I now offer an FIP guarantee in our Health Guarantee. It is VERY IMPORTANT that all cat owners and potential kitten buyers do not panic when hearing the term "FIP" and the proliferation of so much untrue and inaccurate facts contained on the internet, and even some veterinarians that do not keep up-to-date about the most current research and recommendations. I house my Persian cats in small groups, (less than five adults). No over-crowding. I have several Feliway Classic diffusers around the house. 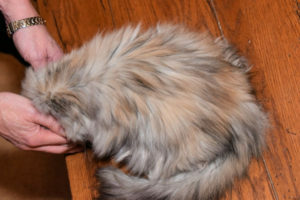 This product reduces stress-related signs like urine spraying, scratching, fighting or hiding by releasing natural feline pheromones to soothe the cats. My adult breeding males are kept separate from all the other cats except at breeding time at which time, a male cat is only "temporarily" housed with one female at a time. 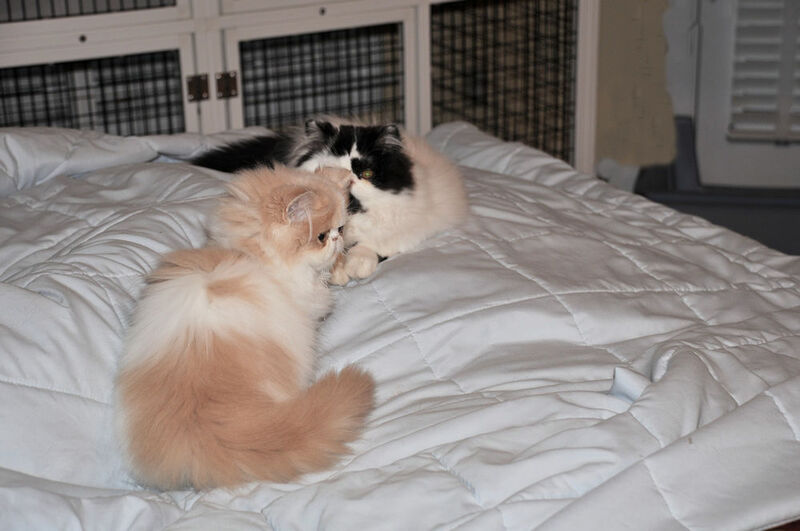 New arrivals are isolated for approximately six to eight weeks from our other cats. If and when a cat becomes ill, it is isolated/quarantined from other cats/kittens. Kittens are housed with their mom individually, or sometimes, two moms may co-parent their babies. I am consistently cleaning and disinfecting our entire home, rooms where our cats may reside at any given time, "cat" room, and cat enclosures. I also have our veterinarian come to our home once a year to perform health check-ups on all of our cats (and the dogs) and to see and make recommendations for any changes that need to be made for the health of my cats. More often than not, my veterinarian says I am very good at keeping the cats and their environments healthy and clean. I am consistently cleaning and disinfecting litter boxes, bowls, bedding, etc. Does this mean one of my kittens may not (at some time) develop FIP? No, I cannot guarantee that. No one can, no cattery can, no shelter can, no rescue group can, (etc.). Veterinarians cannot even predict which kitten or cat will have active, clinical FIP, so how can I? All I can do is continue to keep my numbers small, keep my cats and kittens as healthy as possible, use good cleaning and disinfection practices, and feed a healthy diet – all to keep my cats (and kittens) as stress-free and healthy as possible. An Update on Feline Infectious Peritonitis, The Veterinary Journey, by Niels Pedersen, DVM. Overview of Feline Infectious Peritonitis, Merck Manual Veterinary Medicine. This is the one disease that scares me more than any other. I’ve never had a cat with FIP but have friends who have and it is heartbreaking. Thanks for a great newsletter on the subject. I have heard from Vet School newsletters that cat owners should have one ltter box per cat and I have three cats and four litterboxes, not that every cat uses his/her own all the time. I have said before and will say again you are the most ethical breeder I know and I wish all breeders were of your caliber. My Lili who I got from you is the love of my life. She brings us joy every single day. Thank you for making so many people happy. Thank you so much. I really, really had to consider the possible negative ramifications in admitting how horrible last year was for me, my kitten buyers, and my own cats and kittens. You are correct, FIP is the worse thing and I wish with all my heart the “experts” can figure out how to eradicate this awful disease. Give Lili and hug and kiss for me. I lost my first Persian to FIP 5 years ago. Reading your article makes me cry because I know how helpless you feel when you find out your precious baby has it. After many visits to the Vets I was told my cat had FIP. My reaction was “what’s that?””Give him something to make him better”, “what did I do wrong?”. I choose to euthanized my baby because he wouldn’t eat. Sadly, he was so sick. I had another young kitten at home and I was scared for months. More information is needed about this horrible disease. I am so glad you as a breeder opened up about it. Everyone needs to be aware it can happen and it’s not your fault. I felt guilty for years that I didn’t take care of my cat. I read and read many articles about it. I spread my knowledge to everyone like you just did and that is so wonderful of you. Thank you so much in my cats memory. I am so very sorry that you lost your precious companion to FIP. The last kitten that I lost I was on the phone with my vet crying and asking him to tell me what I was doing wrong or what I could change. His answer was that he has been to my house many times, examined the animals on a yearly basis and he saw the lengths I go to clean and disinfect everything in the house. FIP is horrible and I sorely wish that it could be eradicated on a permanent basis or, at the very least, come up with a medication that will cure it. Sadly, by the time most of us notice the kitten is ill, it is already too late. You did nothing wrong. FIP just happens. Again, I am very sorry for your loss. I just want to add that my sister in law adopted two domestic kittens from a shelter a year before I got my kitten and both her kittens died from FIP. One had the wet and one had the dry. It doesn’t Just happen to kittens from breeders. It’s a mystery disease and very scary. 2. People are better pet parents when they are informed about feline-feline related issues. My condolences to your sister-in-law.